Franklin College announced today that its mathematics and computing department has been awarded a prestigious national honor by the American Mathematical Society (AMS). The society, after a review of the department’s programs, has recognized the college as the recipient of its 2019 Award for an Exemplary Program or Achievement in a Mathematics Department. Previous recipients of the award include UCLA, University of Illinois at Urbana-Champaign, University of Arizona, Harvey Mudd College and Williams College, to name only a few. The award was made public by T. Christine (Chris) Stevens, Ph.D., the associate executive director for meetings and professional services for the American Mathematical Society, during a special event held on campus on Monday, April 8. The AMS is a national association of professional mathematicians committed to advancing research and scholarship. It provides information and guidance on best practices to math and computing programs across the country. In particular, the society recognized the department’s selection as a featured part of MathFest in 2016 and 2017, hosted by the Mathematical Association of America. 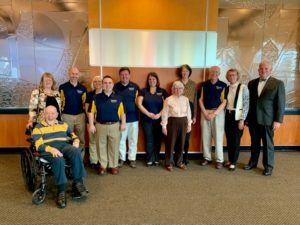 There, Franklin College faculty showcased their model for student success in a minicourse called “Creating a Purposeful Student Learning Experience.” The MAA recently announced that the department would be on the program again this year. Franklin College Professor of Mathematics Dan Callon, Ph.D., said the AMS award is the result of the unique traditions cultivated by the mathematics department. “This award, and the series of amazing achievements by our department in the last year, is a testament to the culture developed by the investment of time, talent and energy by our wonderful current and emeritus faculty and staff, our outstanding students, our highly-involved alumni, our welcoming community partners and our generous donors,” Callon said. This is the second significant national recognition the college has announced this academic year. In November, the college announced that its mathematics and psychology faculty were selected to be featured in a national training program produced by the Association of College and University Educators to promote excellence in career readiness initiatives at colleges and universities. Those programs were two of only five departments in the Midwest to be selected as models of preparation in 21st century career skills.